I initially got this for Emily for the road trip to Illinois but when she moved to the second book, I decided to see what all the "hype" was about and started reading too. Vampires, Werewolves. Really? I only hope the movie version is as good. Emily and I are counting the days. Everyone in Gustavo's family is in a mariachi band. Everyone except Gustavo, that is. They all play violÃ­ns, trompetas and guitarrones. They all make wonderful music in restaurants and at wedding parties. Gustavo would love to join the band, but he can't play any of the instruments. What's a wannabe mariachi to do? Over at the pbj's we are having another picturebook spotlight! 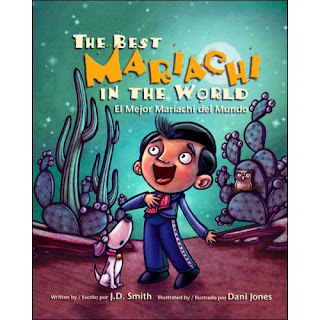 We are celebrating with the very talented Dani Jones, who is the illustrator of The Best Mariachi In the World, written by J.D Smith and published with Raven Tree Press. 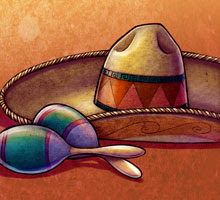 "In what Mexican state did mariachi music originate?" Submit your answer in the commets section this week to be entered. See you there and join in the fun! I'm really excited because Soundprints has given me permission to share the cover art with you for the board books I'm working on. I ended up doing the illustrations with my "digital felt" style. Initially, I was hired to do them in traditional felt but after some deadline issues I asked if they would consider the digital. Thankfully, they did and we are all happy campers. Here is a little bit closer view. I have had so much fun working on these. I am really excited to share that we are spotlighting Carlyn Beccia and her new book, The Raucous Royals over at the PBJ blog. We'll be interviewing Carlyn all week. And that's not all. She has kindly offered a signed copy of her book! Click here for more details.